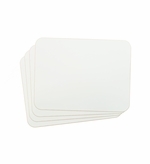 Now you can order extra plain white dry erase boards to go along with your custom printed order. 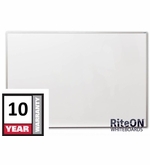 These are the same quality dry erase boards we use to create our custom printed whiteboards. 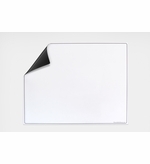 You can order both magnetic and non-magnetic whiteboards. The non-magnetic whiteboards are less expensive and you can't use any magnetic accessories with them. Both options have a terrific dry erase writing surface. We've also added a line of black dry erase boards to our line. These are great to use in restaurants, bars, pubs and deli's with fluorescent markers and black lights. We make these black dry erase units in our own warehouse in Massachusetts. From what we've been told the old style black melamine boards are no longer available because of a change in the way the boards can be manufactured so these new boards might actually be another OptiMA exclusive. 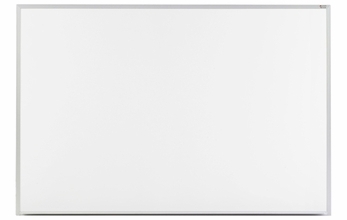 We know that you're always searching for a quality dry erase board from a company that you can trust... that's us! From "Sizes" "203: 2' Tall x 3' W (+$88.95)" "302: 3' Tall x 2' W (+$88.95)" "304: 32\" Tall x 45.5\" W (+$159.95)" "403: 45.5\" Tall x 32\" W (+$159.95)" "404: 4' Tall x 4' W (+$229.95)" "405: 4' Tall x 5' W (+$269.95)" "406: 4' Tall x 6' W (+$309.95)" "408: 4' Tall x 8' W (+$389.95)"
From Size "182: 18\" Tall x 24\" W (+$34.95)" "218: 24\" Tall x 18\" W (+$34.95)" "202: 24\" Tall x 24\" W (+$49.95)" "203: 24\" Tall x 36\" W (+$54.95)" "302: 36\" Tall x 24\" W (+$54.95)" "304: 32\" Tall x 45\" W (+$98.95)" "403: 45\" Tall x 32\" W (+$98.95)" "404: 4' Tall x 4' W Truck (+$159.95)" "405: 4' Tall x 5' W Truck (+$189.95)" "406: 4' Tall x 6' W Truck (+$219.95)" "408: 4' Tall x 8' W Truck (+$259.95)"
From "Select Size" "403: 45.75\" x 36\" (+$99.95)" "404: 45.75\" x 44.5\" (+$119.95)" "406: 45.75\" x 68.5\" (+$169.95)"
Individual Student Lap Boards, 9 x 12 and 12 x 18 in a variety of pack sizes. From Options "9\" x 12\" Single Board (+$1.95)" "CS: 9\" x 12\" Pack of 24 (+$31.95)" "48: 9\" x 12\" Pack of 48 (+$62.95)" "" "LG-S: 12\" x 18\" Single Board (+$3.95)" "LG-12: 12\" x 18\" Pack of 12 (+$39.95)" "LG-CS: 12\" x 18\" Pack of 24 (+$78.95)"
A line of non-magnetic black surface dry erase boards to use with fluorescent markers. From "Select Size" "1824: 18\" x 24\" (+$32.50)" "2418: 24\" x 18\" (+$32.50)" "2436: 24\" x 36\" (+$55.00)" "3624: 36\" x 24\" (+$55.00)" "" "1824-NT: 18\" x 24\" No Tray (+$32.50)" "2418-NT: 24\" x 18\" No Tray (+$32.50)" "2436-NT: 24\" x 36\" No Tray (+$55.00)" "3624-NT: 36\" x 24\" No Tray (+$55.00)"